Our school year runs from September through May. • The morning session meets from 9:00 - 11:30 AM. • The afternoon session meets from 12:30 - 3:00 PM. • Mom & Me classes meet one morning per week, Wednesday, Thursday, or Friday. These classes are for 2 year olds. Registration is by semester. • 2 Day classes meet Tuesday & Thursday. There are classes for 3 and 4 year olds. • 3 Day classes meet Monday, Wednesday, & Friday. There are classes for 3, 4, and 5 year olds. • 3 Day + 4th Day Cooking Class meets for a regular 3 Day class as well as Tuesdays. The 4th day class is a separate curriculum focused on foods from around the world and cooking activities. The children attending this program need to be eligible for kindergarten the following year. • 5 Day classes meet Monday through Friday. These classes are for 4 & 5 year olds who are eligible for kindergarten the following year. An integral component of each of the above programs are our special classes. These include Bible Lessons, Science, Gym and Music. Our day begins with a child directed Play Time. 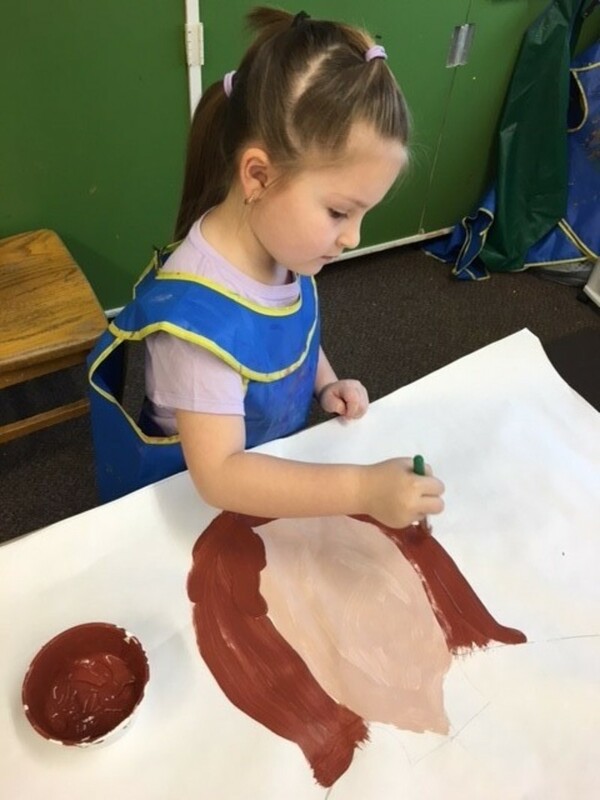 The child can move freely about the various classroom centers which offer puzzles, blocks, manipulatives, dramatic play, housekeeping center, art table and resource stations while also interacting with his or her peers. Also during this time, each child is invited to engage with the teacher in an activity on a 1:1 or small group basis. Following Play is Clean-Up Time. We practice our social, sorting, organizing and problem solving skills as we work as a team to put away all of our materials and toys. During Circle Time, the children gather together for prayer, calendar and the day’s agenda as well as stories, songs, finger plays and other group learning activities. Art Time is a time to strengthen not only our small motor skills, but also to flex our creative muscles. Various materials, tools and techniques are used. We are also working on our listening and direction following abilities. Snack Time is always a favorite! The children take turns serving snack which begins with prayer. This also becomes an opportunity to practice our manners and social skills as well as a chance to possibly taste something new! In addition to our typical activities, our curriculum is enhanced with special classes. Bible Lessons: In addition to the mini Biblical lessons incorporated into each day, a specific time is set aside to intentionally focus on a particular lesson or Scripture. This is held in the Church’s Sanctuary or Upper Gathering Room to emphasize the importance of the lesson. Creation, Noah, Moses & The 10 Best Ways, the Nativity, the life of Jesus, the Miracles, and many others are learned. These are taught using manipulatives, felt pieces, and three dimensional figures to aid in understanding. Science: Each week, a child’s innate curiosity about the world around them is utilized visiting the Science Room. Different topics from all areas, such as the environment, animals, our bodies, sink & float, magnets, dinosaurs, outer space, the weather and simple machines, are included. Science processes such as communication, observation, estimation, measurement, cause & effect, investigation, experimentation, and evaluation are also developed and encouraged. Gym: Because Pittsburgh weather is not always conducive to outdoor play, we are blessed with a large gym area. The entire bottom floor of our building is filled with tricycles, rocking horses, basketball hoops, a balance beam, a slide and climber as well as many other pieces of equipment to foster gross motor skills as well as imaginative play. Music: Music, movement, song and dance are all parts of each and every day, however in addition, we also have special music classes. Each month our music teacher engages the students with new harmonies, rhythm and ways of looking at music. She also introduces many instruments. If we can’t play them ourselves, we can experience a professional doing so. We get to share some of our favorite songs and dances with our families at the End of the Year Celebration.